Humidifiers replenish the much-needed moisture in the air inside. This is important because warm, dry air absorbs moisture from everything around it. Using a humidifier as a complimentary device to your heating or furnace system allows for better breathing and more constant temperature. 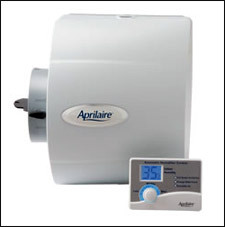 Big humidification performance to match the biggest homes: the Model 700A. 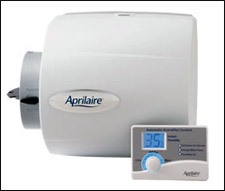 The Aprilaire Model 700 Whole-House Humidifier features truly automatic control, so there's never a need to manually control the humidifier—though it can be installed in manual mode, if desired. Get big results for small to mid-size homes with the Model 500A Whole-Home Humidifier. 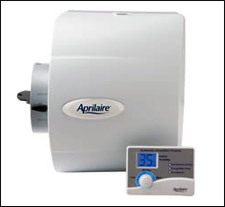 The Aprilaire Model 500A Whole-House Humidifier features a built-in bypass damper and is designed for use in small to mid-size homes with automatic digital control for premium performance and convenience. 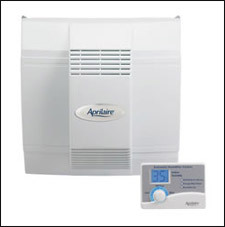 Need to maximize your humidity control with minimal water? Choose the Model 400A with automatic digital control. Humidifies tightly-constructed homes up to a 4,000 square foot in size.